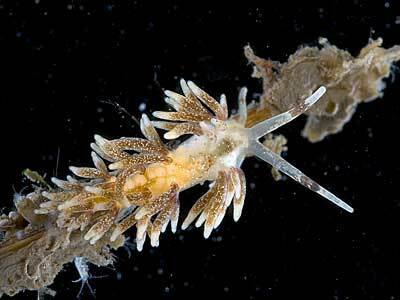 Description: This inconspicuous nudibranch has a translucent body with patches of brown pigment at the bases of the cerata, and brown rings on the rhinophores and oral tentacles. The back of the body and the surfaces of the cerata are speckled with gold or yellowish-white pigment flecks, with the densest speckling at the tips of the head tentacles and cerata. The jaws are visible in the transparent head, and the corners of the foot are rounded. Typically about 10mm in length. 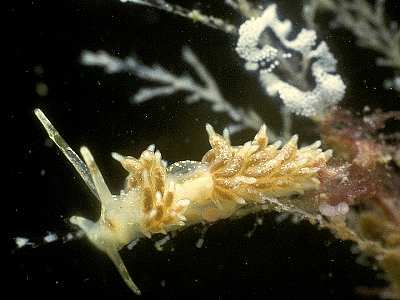 Habitat: Found on the common hydroid Halecium halecinum, which seems to be the exclusive food. The spawn is a thin white scalloped ribbon, usually wound untidily around the food. Distribution: Widespread throughout the British Isles, and known from as far north as Orkney and as far south as the Mediterranean. Similar Species: Rubramoena rubescens is very similar to this species, but the brown coloration is replaced by red. Brown rings on head tentacles and patches at the bases of the cerata. Gold specks on body, cerata and head tentacles. Picton, B.E. & Morrow, C.C. (2016). Rubramoena amoena (Alder & Hancock, 1845). [In] Encyclopedia of Marine Life of Britain and Ireland.